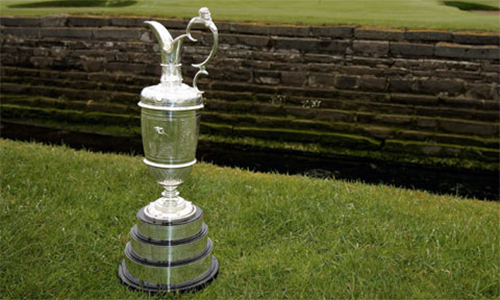 The British Open, which concluded two weekends ago, is my favorite golf tournament of the year. The Claret Jug. The grandstands lining the 18th hole. That knee-high ruff. Best of all, I get to watch golf first thing in the morning while eating breakfast. I play golf frequently, and I write frequently for our clients and their content marketing needs. This got me thinking: Are there are parallels between golf and content marketing? This post is for you if you\’re a content marketer who has to explain your job to a golfer or a golfer who has to explain your passion to a content marketer. No one is born a great golfer. Sure, some people are gifted with certain physical traits, but the ability to hit a pitching wedge exactly 113 yards to a tight pin while thousands watch has nothing to do with physical skills. It\’s a talent honed on the driving range, in junior tournaments and in amateur events. Similarly, nobody is born a writer. The only way to become one is to write — and write some more. There is nothing like putting words to paper (or screen), struggling to find that ideal verb, editing until you can\’t edit any more and then pairing everything in a great design. The easiest way to hurt yourself on a golf course — yes, that\’s an ironic statement — is to swing hard on the first tee without any warm up. Many sore backs and rotator cuffs later, you\’ll realize that visiting the driving range is a good idea. Same with jumping into an article, blog post or any content project. The creative process has its own warm up. It just happens more subliminally. Great writing starts with the germ of an idea which grows into a headline and then an outline. After you\’ve warmed up to the idea, then you are ready to write. If you watch good golfers, they rarely swing violently at the ball. They have learned through practice to move their bodies and their clubs in a seemingly effortless sequence that can hit a golf ball the length of three football fields. Good golfers also approach each shot with the same rhythm. This \”pre-shot\” routine puts them into the right frame of mind to execute the desired shot. Watch pro golfers on television and you\’ll see go through the same steps every time — though each will be a little different. Content marketing has the same pacing and flow. The lede. The subheads. The graphics that illustrate your ideas. They all work together to create something meaningful, useful and/or entertaining for the reader. Great writers also have a pre-shot routine. They do specific things that prepare them for task. It may be writing at a certain time or taking a walk before sitting down behind the computer. Daniel Silva, author of the bestselling Gabriel Allon series, prefers writing with a pencil while laying on his stomach on the floor. It works for him but would never work for me. Good golf is about concentration in the moment — even though the golf swing only lasts about two seconds. Golfers value the silence and lack of distraction so they can focus on the task at hand. Good writing demands the same freedom from distraction. There\’s nothing like getting in the flow of a great article only to have the phone ring or an email alert pop. Golfers have unique styles. Some are daring and take greater risks. Others are more conservative and take what the course gives them. You have to know your style of play to be successful. Mixing two styles in the same round of golf rarely works. The same is true of writers. It\’s that mysterious thing that we call voice. It\’s hard to describe, but you\’ll know it when you read it. Style is also about authenticity. While George Will or Hunter S. Thompson have unique styles, their audience identify with their authenticity. Many years ago, Amy and I went on a business trip to Scotland. I convinced her to take a day trip to St. Andrews so that I could play a round at the home of golf. As we walked down the fairway of the 1st hole of the New Course taking in the sites, Sean Connery was playing right next to us on the famous Old Course pulling his bag on a cart. It was a cool moment that didn\’t involve a golf swing. There were some less than fun moments on the golf course trying to adjust to a new style of golf. Great writing lives through great stories. Writing without stories is toast — useful but bland and unremarkable. Writing through stories is French toast — tasty, filling and potentially memorable. Nobody every bragged about how many shots they took in a round of golf. In fact, too many shots can be downright embarrassing (though, ironically, a good story). Playing golf well means wasting as few strokes as possible. The same can be said of writing. You don\’t want to add any unnecessary words. They don\’t add value. Golfers can catch a disease known as the \”yips.\” They have a disastrous effect on short putts, often those at the end of the round when more bets are on the line. There is nothing physical about the yips. This disease is a lack of confidence in executing what is really a simple golf shot. A serious case of the yips can cost a professional golfer his or her career. Writers block is much the writer\’s version of the yips. Despite writing well hundreds or thousands of time in the past, you stare at a piece of paper or a screen trying to force words out of your mind. Writers block is also about confidence. Instead of writing through it, you self-edit and think of all the ways people won\’t care about or read your work. Professional golfers says they \”drive for show and putt for dough.\” A long drive may please the spectators, but the pro who has the fewest putts for the week often wins and takes home the big Happy Gilmore check. Good golfers can tell you their stats for fairways hit, greens in regulations, putts per round and more. Well-written content that no one reads accomplishes little. Good content marketing has to drive views, shares, conversions and other metrics that are important to your marketing plan. The 19th Hole in golf is that place you go to relive your round with friends while enjoying an adult beverage or two. Some golfers start the enjoyment while still on the course. The content marketers that I\’ve spent time around are certainly not afraid of a libation, especially after a long day of knocking out blog posts or finishing that detailed white paper. And, yes, some even started before the day was over. Finally, congratulations to Rory McIlroy on becoming the Champion Golfer for the year.